Heat ghee in a pan and roast sooji/ rava till it becomes slight brown in color. Take is aside and heat oil in a same pan. Add mustard seeds, cumin seeds, whole peanuts, green chilies, pinch of asafoetida and curry leaves. Let them crackle. Add shredded ginger, urad dal and chopped onion. Saute till onion turns translucent. Add tomato cubes, turmeric powder and salt to taste. Mix well and cook for 2-3 minutes. Add yogurt and water to it. Let it boil. Now, add roasted sooji and keep stirring. Remove all lumps. Cover the pan and let it cook for 5-6 minutes on medium heat. Keep stirring in between. Finally add chopped cilantro and serve hot by adding some fresh grated coconut on top. upma looks wonderful. But I never added turmeric to upma. nice recipe. healthy upma adding yogurt new to me.. Perfect for break fast..nice clicks !! Sooji upma looks so colorful n inviting!! Colorful and delicious, looks so good. This looks really very healthy and delicious too....thanx dear 4 sharing this...nice. 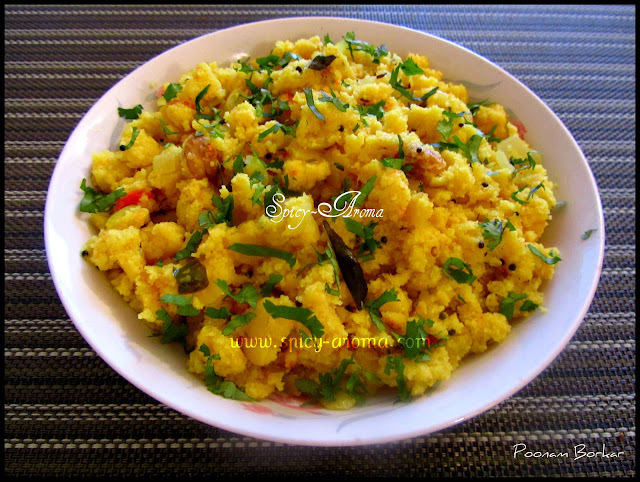 Very healthy and colorful upma. i don't mind having a whole plate of it. looks great! Yummy upma. Loved the way you sprinkle cilantro as garnish on the food. Looks very unique and lovely. Colourful and delicious sounding, I like the ingredients.